Jakarta – The instrument is driven by brain signals not imaginary. 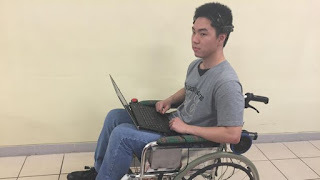 Two students at the University Bina Nusantara (Binus) developed a wheelchair driven brain signals. Is Jennifer Santoso (21) and Ivan Halim Parmonangan (21), seventh semester student of Informatics who made the thesis project because they see a lot around it needed a wheelchair. From the observation of persons with disabilities around them, it turns out, many disabilities that brain and mind are still healthy. Thus, Jennifer and Ivan develop a wheelchair with the brain’s control. This study actually continue and develop research their seniors. Thus, the main components are wheelchair and a tool called neuroheadset. Neuroheadset is a tool that can capture and reinforce the brain’s electrical waves in scale thousands of times. Neuroheadset is connected to the software applications they create in the CPU. “Our application will process the signals received from neuroheadset, then filtered to take the alpha and beta waves, which are then transformed by the Fast Fourier Transformation algorithm, which then becomes the input to the engine,” explains Jennifer. Applications are made will then forward the signal being processed into the Arduino Uno microcontroller board, and forwarded to a motor driver that will be used to drive the DC motor, the electric motor works using a DC voltage source. 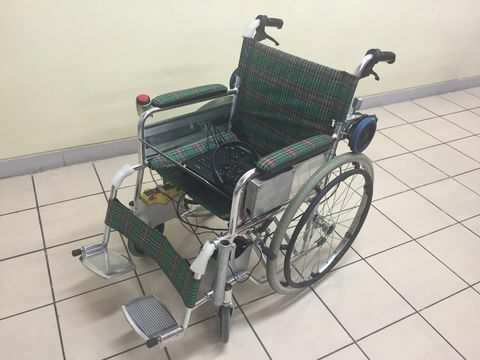 The workings of this wheelchair wearing 2 data, with electric encephalo- graphi (EEG) brain signal alias for disabilities that can not move his neck and with gyroskop to capture the motion sensor, for patients who are still able to move the neck. Sightings wheelchair, intertwined wires on the left which is connected to a metal box containing a microcontroller and motordriver, and no batteries housed in the metal box underneath. Ivan then demonstrate the wheelchair. He sat in a wheelchair, wearing a wireless neuroheadset with 14 stems in a circular on the head, and assuming the laptop. For the first user, the application software should record the user response, the brain signals to move forward, left, right, rotate left and right of neuroheadset. Then, to drive the wheelchair, Ivan looks to focus once. The wheels of the chair to move forward, while Ivan just sit on my hands. When you want to stop the wheelchair, simply with a twinkle in the eye, left eye, right or both eyes. “When asleep or panic, the wheelchair automatically stop,” said Jennifer. 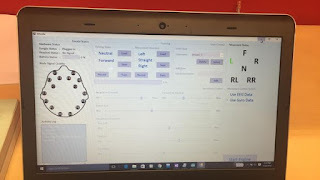 Tools and applications that they named Bina Nusantara of Wheelchair (BNW) – Chair Wheel to control this brain they have developed since last February to October 2015. “The old one is we are looking for ways how to make this application easy to use for users,” said Jennifer. Their work won race 2 in the National Student Exhibition of Information and Communication Technology (Gemastik) 2015 intelligent systems category. This research also deliver their thesis supervisor, Dr. Widodo Budiharto, SSi, MKom entered the top 15 National Outstanding Lecturer. This research was funded by Toray Research Grand from Japan.